Plus Size Kitten: TRY MIREICA FOR FREE! 2. Send Email to Mireica@Mireica.com (name, contact & address). 3. Stay tune for Updates on their FB! *Limited to 3000 samples only. First come first serve. For Malaysian residents only of 21 years and above. One sample per person (while stocks last). The contact information you provide will remain strictly confidential and will not be sold to any 3rd parties. Please allow 4-6 weeks for processing. 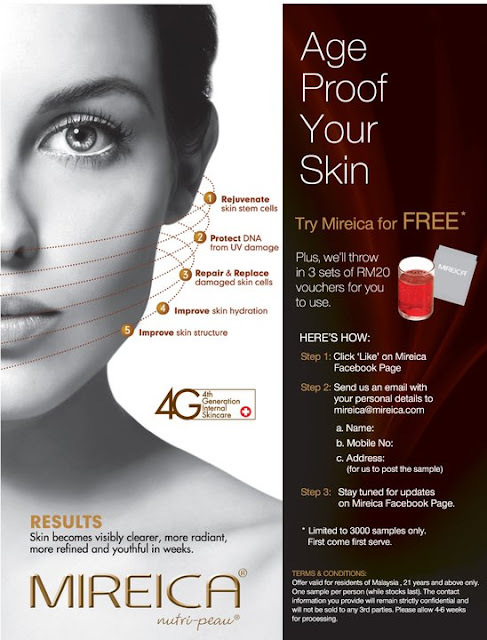 Miu says: Mireica is a collagen drink for those who wants youthful looking skin from drinking this! There's a lot of brands out there in the market now if you visit Guardian/Watsons/Sa Sa. Winnie Loo from A Cut Above drinks Mireica to keep herself youthful! (is it true or not?) try a sample to see for yourself by doing the steps above. I got an email reply from them confirming my sample already. Please follow the terms and conditions, if you're not above 21 years old, kindly refrain from trying as you do no need such a drink! thank u miu for this! great to hear that so it's true! she looks young for her age!! !